The artist took Li Feng, a person who has been blind since birth, to the top of Beijing"s famous Fragrant Hill. 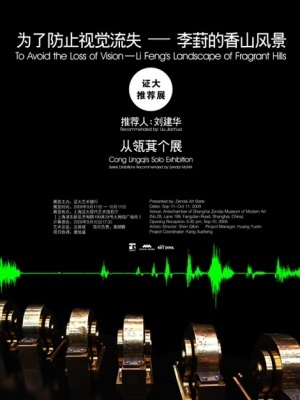 The artist used a recording device to record Li Feng"s verbal description of her reaction to Fragrant Hill. Afterwards, the artist transcribed the oral narrative in Braille and recreated the bumpy pattern of the Braille on the surface of a wheel, which is a part of a music box that plays a sweet-sounding musical scale when brushed with a musical chip. The sounds produced by the music box are recorded by an attached microphone and uploaded directly into an audio frequency software, transformed into a visual spectrogram, and projected on the wall.